Organized at Indianapolis, Ind., and mustered in September 30, 1861. Ordered to Louisville, Ky., October 4. Duty at New Haven and Munfordsville, Ky., until February, 1862. Served unattached, Army of the Ohio, to June, 1862. Artillery Reserve, Army of the Ohio, to July, 1862. 7th Independent Brigade, Army of the Ohio, to August, 1862. 28th Brigade, 3rd Division, Army of the Ohio, to September, 1862. 28th Brigade, 3rd Division, 1st Corps, Army of the Ohio, to November, 1862. 1st Brigade, 3rd Division, Right Wing 14th Army Corps, Army of the Cumberland, to January, 1863. Artillery, 3rd Division, 20th Army Corps, Army of the Cumberland, to October, 1863. Artillery, 1st Division, 14th Army Corps, October, 1863. 2nd Division, Artillery Reserve, Dept. of the Cumberland, to November, 1863. Garrison Artillery, Chattanooga, Tenn., Dept. of the Cumberland, to October, 1864. Garrison Artillery, Nashville, Tenn., Dept. 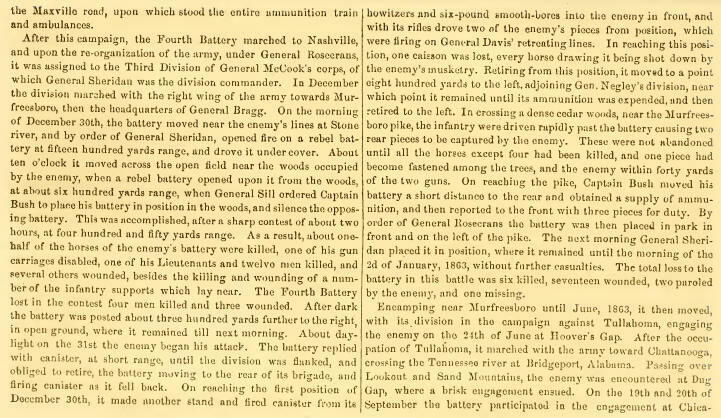 of the Cumberland, to December, 1864, and at Murfreesboro, Tenn., until July, 1865. SERVICE.--Advance on Nashville, Tenn., February 10-March 3, 1862. March to Savannah, Tenn., March 17-April 7. Advance on and siege of Corinth, Miss., April 29-May 30. Pursuit to Booneville May 31-June 6. Buell's Campaign in Northern Alabama and Middle Tennessee June to August. March to Louisville, Ky., in pursuit of Bragg August 21-September 26. Pursuit of Bragg into Kentucky October 1-15. Battle of Perryville, Ky., October 8. March to Nashville, Tenn., October 20-November 9, and duty there till December 26. Advance on Murfreesboro December 26-30. Battle of Stone's River December 30-31, 1862, and January 1-3, 1863. Duty at Murfreesboro until June. Expedition toward Columbia March 4-14. Middle Tennessee (or Tullahoma) Campaign June 23-July 7. Hoover's Gap June 24-26. Occupation of Middle Tennessee until August 16. Passage of Cumberland Mountains and the Tennessee River and Chickamauga (Ga.) Campaign August 16-September 22. Davis Crossroads or Dug Gap September 21. Battle of Chickamauga September 19-20. Rossville Gap September 21. Siege of Chattanooga, Tenn., September 24-November 23. Chattanooga-Ringgold Campaign November 23-27. Garrison duty at Chattanooga until September, 1864. Veterans and Recruits transferred to 7th Indiana Battery September 21, 1864. Old members mustered out October 6, 1864. Battery reorganized October 14, 1864. Moved to Nashville, Tenn., October 28 and duty there until December. Battle of Nashville December 15-16. Moved to Murfreesboro, Tenn., and garrison duty at Fortress Rosecrans until July, 1865. Moved to Nashville, Tenn.; thence to Indianapolis, Ind., July 19. Mustered out August 1, 1865.